LAKELAND, Fla. – Designated blocker? Sounds more like a baseball position. That was the situation for Isaac Sames in Plant’s 13-10 thrilling victory against Lakeland on Friday night. The junior came up with a huge field goal block to set up the Panthers’ game-winning touchdown drive in the Class 7A-Region 2 final. “Last year, he was just on the scout team, and I just kept saying, ‘he’s got to be offsides,’ because he was blocking field goals all the time. He’s one of those guys that have a knack for it. It’s pretty amazing,” said Plant (Tampa) head coach Robert Weiner. Friday marked the second straight game where the Panthers came back with a game-winning drive. They did it last week at Viera, where Micah McFadden punched in the decisive rushing touchdown, giving them a 22-18 victory. Friday also marked the third straight year where the Panthers and Dreadnaughts met in the playoffs – each team splitting a game in the process. Round Three. This rivalry goes back a long time. We're about to write another chapter. 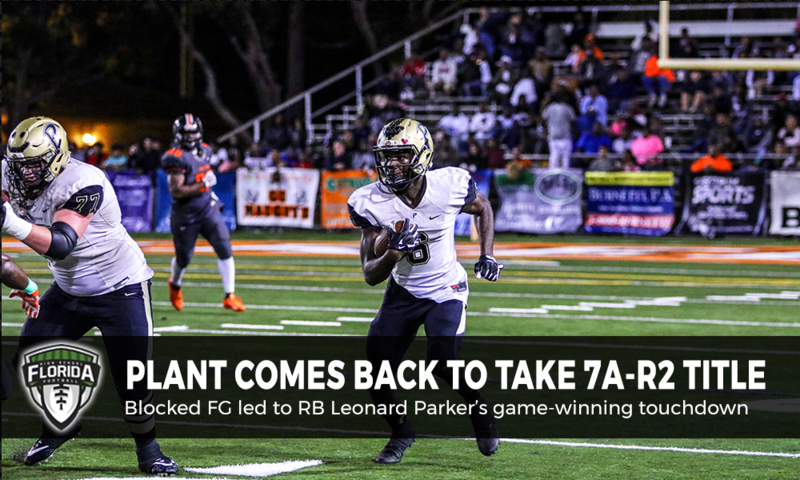 @PlantFootball – @LHSDreadnaughts on deck. Lakeland opened the scoring when QB Kevaris Thomas found WR Daikwon Lawson for a 78-yard touchdown. It was one of the only plays that opened any offense between the two sides aside from a few nice runs from Demarkcus Bowman. On the next Plant drive, Evan Passath missed a 37-yard field goal. He’d redeem himself with a 32-yard boot on the next Panther possession after Brandon Brooks intercepted Thomas. Passath would knock in another 27-yard kick after an 18-play, 5 penalty drive with 20 seconds left in the first half. Plant stuck around, only down 7-6 at the half. The Panthers would get the ball back after the break, but it would go quickly back in the hands of the Dreadnaughts after a fumble deep inside Plant territory. Branson Brown would recover it for Lakeland. Jesse Williams kicked a 32-yard field goal to extend the Lakeland lead after the recovery. Walter Wilbon, who had carried the ball consistently well for Plant throughout the night, went down with an injury midway through the third quarter. He would be sidelined for the rest of the affair as a result. That opened the door for Leonard Parker. Coming into Friday, Parker had 214 yards on 50 carries with three touchdowns. He would be the most vital part of the drive after Sames’ blocked field goal. The Panthers drove down the field. QB Jordan McCloud went down for a play but returned to rush for ten yards down to the Lakeland six. Parker broke a tackle and he broke for the outside. A quick spin and then he was in. Plant took their first lead.
.@PlantFootball does it again! @leopar3235 takes it in for the Panthers to take the lead. “The kid’s waited his turn and he’s just a great player. We knew we had another great player coming in when Walt went down and he delivered,” Weiner said. Lakeland tried to come back from the deficit, but the Panther defense stayed tough as time expired to seal the win. FINAL: @PlantFootball 13, @LHSDreadnaughts 10. “These guys may be one of the best, historically, programs in the state and they’re always tough year-in and year-out. If they come out and play their best, and we come out and play our best, then we’re going to win this game. We may not have played our best game, but we played our toughest, and that’s been the case in this game in the last two years,” Weiner said. With the victory, the Panthers advance on to their second straight 7A semifinal, this time, against Bartram Trail (St. Johns), who took down Fleming Island on Friday night. Plant defeated Robert E. Lee (Jacksonville) in the 7A semifinal a year ago. “I don’t know how many more of these [comebacks] I’ve got in me. It’s funny because they’re so good on defense and I’m looking at my play script, and I’m saying, ‘alright, Sean [Love] and Robert [Marve], do we have anything in our bag of tricks?’ That was one for the ages,” Weiner said.